Humax UHD 4tune+ Experience full HD like never before with the 4tune+. It gets even better! Ultra HD (UHD also called 4K) is the magic word, and with it comes four times higher resolution than full HD. 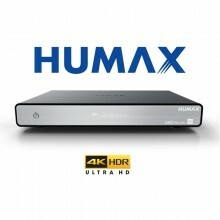 With the UHD 4tune+ HUMAX introduces its first UHD-capable satellite receiver to the market. Enjoy unmatched sharpness and clarity and experience every detail with true lifelike TV pictures. The quad tuner lets you watch, record or stream multiple programs simultaneously. Expand the UHD 4tune+ by means of a standard 2.5 "hard disk or a USB hard disk into a digital Ultra HD/HD recorder. Operate the UHD 4tune+ via smartphone or tablet. Program your favorite shows in advance via the internet or via app and play photos, videos and music from the receiver via your home network. To avoid in-house family programme conflicts there is the SAT> IP function: Stream "your" favourite programme over your home network to your smartphone or tablet and make yourself comfortable there with no one to bother you. FREE: German HD+ 6 month smartcard included, offering over 50 HD channels via Astra at 19.2 East. Click the button below to add the Humax UHD 4tune+ Quad Tuner SAT>IP 4K Digital Satellite Receiver to your wish list.